I know I just wrote a post about underrated movies, but I can’t help but think that this one deserves a post also. W./E. wasn’t Madonna’s first movie, well but the first she directed and didn’t star in, I guess. I didn’t know what to think about her decision to co-write and direct this particular story, but I was not disappointed. The movie revolves around the lives of Wallis Simpson and King Edward VIII and their shocking affair that affected a whole nation. Parallel to their love story, the movie also picks up on the love between a married woman in New York and a Russian security guard. As cheesy as the story might sound, I absolutely adored the movie. It is beautiful to watch and I fell in love with all the characters! 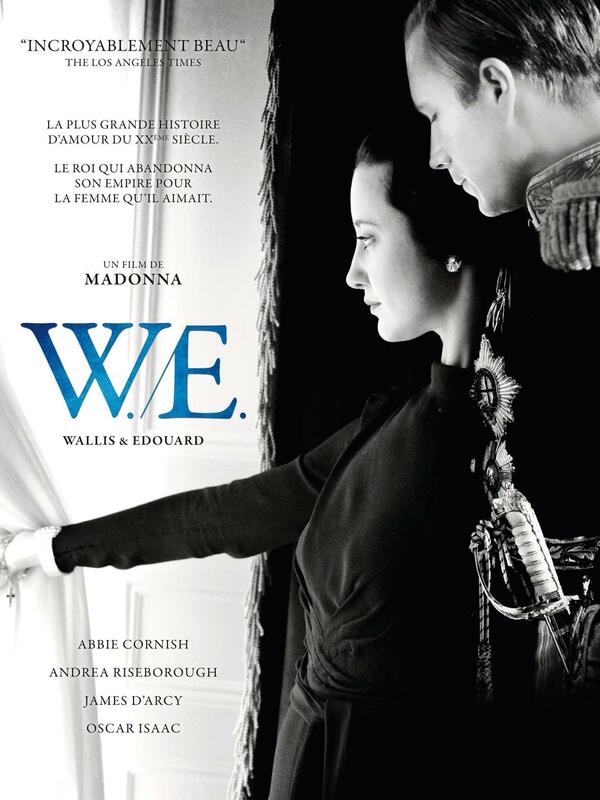 Many people have argued, that Madonna only portrayed the love life of Wallis and Edward, and didn’t mention any of their connections they might have had with the Nazi regime. I understand people’s concern, but I don’t think that this part of history would have been relevant for the story of the movie. It wasn’t about politics, it wasn’t about everything that happened around them; the movie simply was about the two of them. Their love wasn’t easy, and I especially like that they showed the whole story in Wallis’ perspective. I think they did a wonderful job with the movie. Again, another movie they casted wonderfully! If you watch it, you will see: Abbie Cornish, Oscar Isaac, Richard Coyle, James D’Arcy and Andrea Riseborough, as well as many more. Do you know the movie? What do you think about it? The White Queen. A Review.